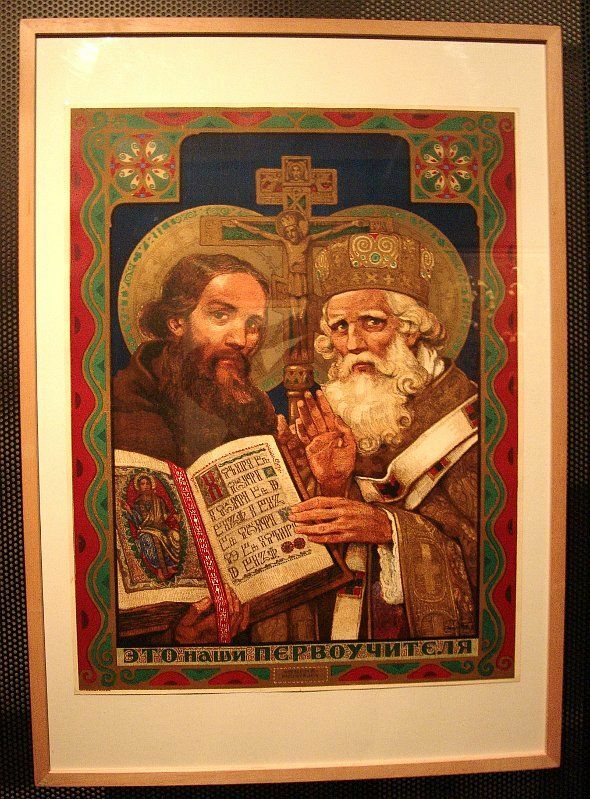 Our special broadcast for Saints Cyril and Methodius Day explores a famous musical homage to the two missionaries and their legacy, Leoš Janáček’s Glagolitic Mass. Leoš Janáček Janáček began this very bold cantata, widely considered one of the finest works of 20th century classical music, at the age of 72, and imbued it with ideologies that were close to his heart. Through his inimitable modern musical language, he illustrated the ideas of Pan-Slavism, the idea of unity among Slavic nations, and pantheism, the concept of nature as god. 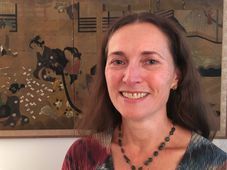 To discuss the mass I invited musicologist and Janáček scholar Veronika Vejvodová to our studio, and asked her first to describe the concept behind the work. 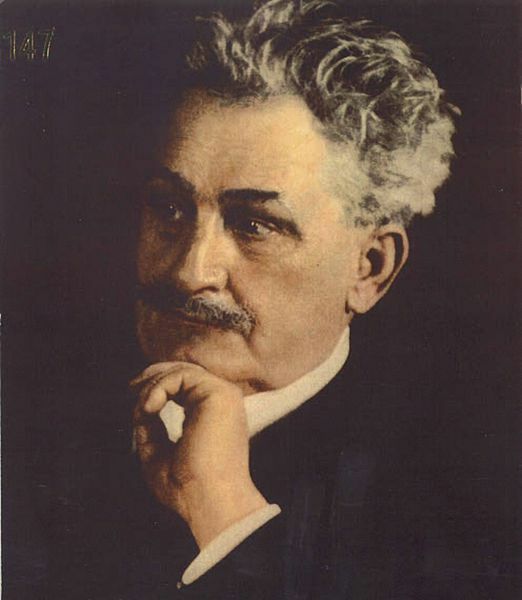 “Janáček got the first impulse in 1920 when he met then Vicar General Leopold Prečan. 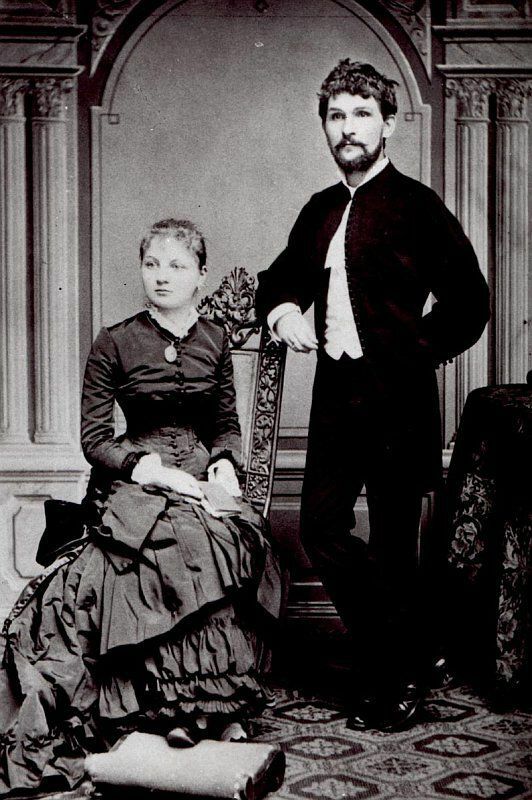 The story is that they met at Hukvaldy – Janáček’s birthplace – where Janáček complained about the quality of music in the church near Hukvaldy. So Vicar Prečan told him, ‘Then why don’t you compose something better on your own?’. To that Janáček said that he didn’t want to use the Latin language and wished he had an Old Slavonic text he could use. So this was the first impulse”. The idea of using an Old Slavonic text I guess came from Janáček’s being a Pan-Slavist, can you speak a bit about that? “Pan-Slavism was very popular at the time because the Czech lands were under the Austrian empire and there was a great national movement for people to have their own country and be independent. 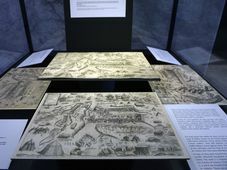 There were ideas that all of the Slavic nations could be united with Russia as the main nation in this united country”. So the mass being in Old Church Slavonic is a kind of celebration of that idea? Cyril and Methodius, photo: Miloš Turek “Yes. 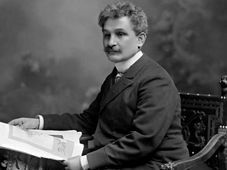 Janáček was also a great Russophile; he admired Russian language, Russian culture and Russian music and all things concerning Russia. What is also very important is that Janáček grew up in a monastery as a child, and this monastery was a kind of centre of Pan-Slavism where there was a specific branch of Pan-Slavism called cyrilometodějství, something like a Moravian school of Pan-Slavism, where they revered Cyril and Methodius, the old priests who brought the Slavic liturgy to the Czech lands. When Janáček was a child there was a celebration of these two men at Velehrad, and he took part in it, singing in the choir there, which was a great experience for him. He wrote a letter to his uncle saying he was very excited about it and needed Slavic clothing for the occasion”. At the same time though, Janáček was not particularly religious, was he? “Yes, that’s correct. Despite the fact that he was a pupil in a monastery and had been an organist and church choirmaster for 20 years, he wasn’t really a Catholic; he rejected the Catholic faith. With Janáček we can talk about a kind of pantheism: the belief that the universe of nature is the same as divinity. There is a funny story about this topic. When Janáček wrote the Glagolitic Mass there was a young pianist from Brno named Ludvik Kundera who wrote a review calling it ‘the work of an old religious man’. Janáček read the review and wrote him a postcard saying only ‘I’m not old and I’m not religious, young man!’ And that was the only thing written on the postcard”. Do you think it is evident in the mass though, that he was not religious? “I don’t think so. I don’t know if we can hear that in the music. 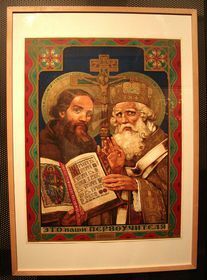 What we do hear in the Glagolitic Mass is great energy, something we can maybe call faith in whatever we want to believe. Not only in god, but in life and nature, in everything together”. 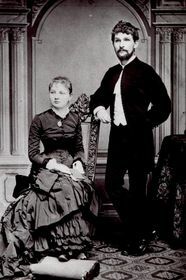 Leoš Janáček and his wife Apparently there were to versions, and the older version was not performed for many decades, partially because it was too difficult. “Yes, one of the things that makes the mass so interesting is the scoring, the use of instruments, such as the timpani. There are three sets of pedal timpani, which was very difficult to perform at the first and second performances, and so after that they just cut these sets of timpani. Janáček himself made a lot of corrections before and after the first performance. But there was another version which was kind of easier to play. “The newest version was made in around 2010, and it is a completely new edition of Janáček’s last corrections, so it may be the most correct version of the Glagolitic Mass”. There are also aspects of the language itself that make if difficult for the singers themselves to perform the work properly, is that correct? “Yes, but that is a problem with all of Janáček’s work in the Czech language – it doesn’t have to be Old Slavonic. It’s not a problem for Czechs to sing in Old Church Slavonic, because it’s not that different, we can understand some words. But it is a problem to sing Janáček’s work in general, because the music is difficult, the language is difficult, and altogether… it’s not easy”. “Janáček wrote in one letter that he didn’t like the organ. He said it was the most unfeeling of instruments, which is why it roared in churches”. But at the same time, the next to last part of the mass is an absolutely fascinating, very avant-garde organ movement. “Yes, we can’t believe everything Janáček said or wrote in his letters because sometimes it was the exact opposite of what he actually did. He was a very expressive person, so even if he might have thought he didn’t like the organ anymore, he still wrote a part of the mass for it. It’s really original, and really expresses his communication with god, or his inner, or spiritual, life”. 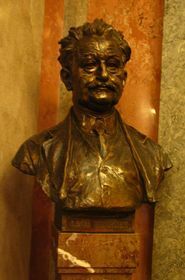 Leoš Janáček's bust in the National Theatre in Prague, photo: archive of Radio Prague What do you find to be really special about this piece personally? Both as a single work in Janáček’s career and within the scope of classical music in general? “We can say it is the only mass in all of Janáček’s work. But what I think is really special may be the context. Because Janáček wrote the Glagolitic Mass at the end of his life, maybe as a kind of expression of his faith, as I said, pantheistic faith, two years before he died. Maybe we can find some similarities with his last opera, The House of the Dead, where there is also something about god and faith. Under the title of that opera he wrote: “In every human being is something of god”. So maybe we can find something of this expression in the Glagolitic Mass too”.